In less than 6 weeks, XBTU17 will expire. Looking to the XBTM17 historical basis helps frame a prediction on how XBTU17 could trade over the next month until expiry. The above chart plots the annualised basis from the time each futures contract became the on-the-run quarterly contract until it became off-the-run. On 15 September 2017, XBTZ17 will list, and will become the on-the-run quarterly contract. Liquidity will gradually migrate from XBTU17 into XBTZ17. 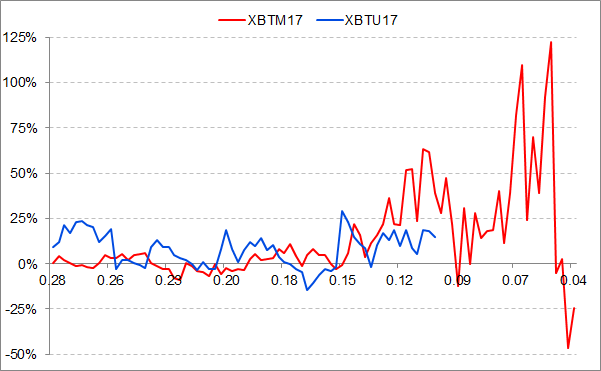 XBTU17’s annualised basis trading range is much tighter compared with XBTM17’s. The below table lists the max and min annualised basis for each contract. With a few weeks remaining, basis traders have a few decisions to make. These decisions depend on their views on the spot price of Bitcoin. Basis tends to spike when the market breaks through a major upside resistance level. XBTU17 basis spiked when spot cracked through $3,000. The next major level is $5,000. If you believe that spot can rise that high before expiry, go long XBTU17 basis into the rally. Once $5,000 is conquered, reverse directions, go short, to put on a cash and carry arbitrage position. On the long side, this trade profits from a rise in basis from the current sub 20% p.a. to an upside target of +50% p.a. On the reversal, this trade profits from earning positive carry by shorting XBTU17 at +50% p.a., and holding until expiry. The diminishing amount of XBTU17 theta remaining means that the basis volatility will fall. Unless there is an explosive rally or correction, the basis will not move aggressively in either direction, but rather slowly diminish into settlement. Traders should take advantage of the positive basis, and short XBTU17, placing themselves in a cash and carry arbitrage trade. The short XBTU17 position is held until expiry. Given the underlying bullishness of the market, dips will be bought. Large XBTU17 % discounts will not persist for very long as bottom feeders load up on cheap Bitcoin long exposure. If such a situation does occur, the previous Range Bound Trading scenario trade recommendation can be closed out early in profit.